MaryAnn Hall, 73, of Manalapan, N.J., formerly of Mariners Harbor, died on Sept. 28, 2016, after a short illness. MaryAnn grew up in Mariners Harbor and lived in Short Hills, N.J., for close to 30 years, and moved to Manalapan 11 years ago. She was an administrator manager for Maintech, Inc. in Cranford, N.J., for over 21 years. MaryAnn was devoted to her children and grandchildren, and loved to travel. She was predeceased by her husband, Dennis, and her sister, Elizabeth Nilsen. 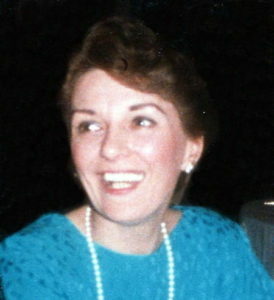 MaryAnn is survived by her sons, Robert Neusch and Chris D. Hall. She was mother-in-law to Linda Neusch; dear sister to Francis William D’Alessio. She is also survived by two granddaughters, Alexis and Rachel Neusch. She also had wonderful nieces and nephews, and great-nieces and -nephews. Funeral will be from Cherubini-McInerney Funeral Home, 1289 Forest Ave. (formerly Meislohn- Silvie) on Monday at 9:15 a.m. with a Funeral Mass at St. Michael’s Church in Mariners Harbor at 10 a.m. Burial will be at St. Peter’s Cemetery. Friends are invited to call on Sunday from 2 to 4 to 7 to 9 p.m.